Homeowners in the north of England are making sure they get the most out of their conservatories throughout the winter by choosing to fit Ultraframe’s climate controlling Conservaglass Optimum. Pennine Home Improvements Ltd, the largest manufacturer and installer of home improvement products in the north-east of England, has reported a huge leap in sales of Ultraframe Conservaglass Optimum. Specially developed for conservatories in British conditions, Conservaglass Optimum dramatically outperforms standard sealed units. It has an impressive ‘U’ value of just 1.1 making it the most energy efficient glass on the market. Based upon technology long established in the USA, the revolutionary glazing material features a unique invisible microcoating with an astonishing ability to keep in the warmth from heating appliances. Conservaglass Optimum also excludes two-thirds of heat-bearing solar energy to keep conservatories 10 degrees cooler during the summer months. In a typical British summer this translates to an amazing 70 extra hours of possible usage per month. Conservaglass Optimum, which has a 20 year guarantee from Ultraframe, also features a unique external coating which helps rainwater run off the glass taking any dirt deposits with it. This means that the glass requires minimal cleaning and homeowners can enjoy a better view from their conservatory. 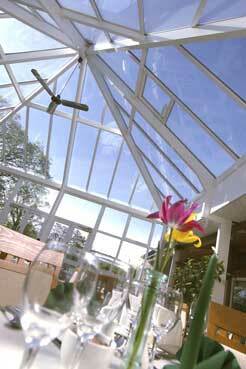 Linda Doughty, Marketing Director at Ultraframe said: “Traditionally people believe that conservatories are summer rooms, but in reality at the peak of the summer they can be prone to overheating if glazing materials and ventilation have not been chosen carefully. The ventilation that is central to all Ultraframe roofs, combined with the outstanding thermal properties of Conservaglass, ensures that homeowners can enjoy their Ultraframe conservatory all year round. Introduced by Ultraframe in 2002, the Conservaglass range consists of three products, Optimum, Premium and Classic, all of which have excellent thermal efficiency and sound reduction qualities. With its unique combination of features and benefits the Conservaglass range from Ultraframe is unsurpassed by any other sealed units available on the domestic market and guarantees homeowners maximum use and value from their conservatory installation.